A paddle cable is probably already attached to your iambic paddle. If the plug is a 1/4" style you will need a 1/4" to 1/8" adapter in order to plug it into the K44. The audio cabling is dependent on the transceiver you are using. The best solution is to use your radio's line output. Depending on the radio's manfacturer, this could be on the Data, RTTY, Packet, or Modem connector. If you are really lucky it is on a separate 1/8" or RCA jack. In most cases you will need a special DIN connector, refer to your radio manual for details. If you happen to have a SignalLink Interface (or equivalent) its AUX output works perfectly as a source for K44 audio. Otherwise you will find that if you plug into your transceiver's external speaker output the transceiver's internal speaker will be disabled. One solution to this is to use one of our K44 audio splitter kits. 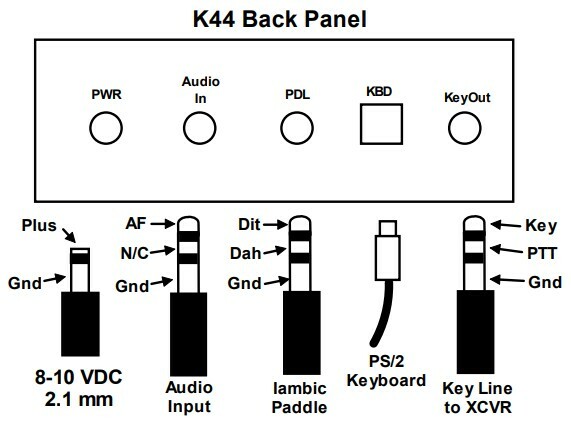 This connects to your radio's external speaker output and provides both a speaker output and a high impedance audio output that connects directly to the K44 audio input. The keying jack on most transceivers is a 1/4" stereo phone type which normally accepts an iambic paddle input. Newer radios are now using an 1/8 key input jack. The K44 uses an 1/8" stereo output jack so you may or may not need an adapter. Don't forget to disable your radio's internal keyer and run it in straight key mode. A two wire connection will work 95% of the time, we recommended using a stereo connector leaving the ring unconnected. The ring connection is really only used to key an amplifier or activate an antenna changeover relay. We offer a universal K44 keying cable kit that covers just about any situation. The kit has one cable with an 1/8" stereo plug on each. You would plug the one end into the K44 key output jack and the other end can go directly into your transceiver if it has an 1/8" key jack. If it has a 1/4" jack use the 1/8" to 1/4" plug adapter included in the kit.